Open Sniffer is configured via web interface which is divided to six sub-pages. RUN/STOP button and status field are located below the top menu. RUN/STOP button is present on every sub- page and always refers to sniffer mode. 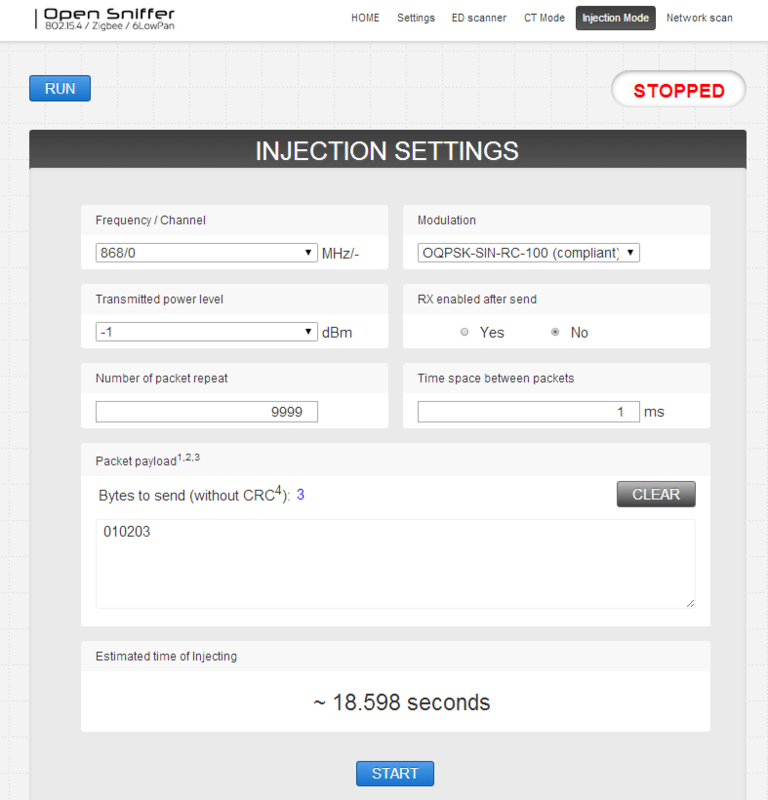 Home page contains following summary information about an analyzer: MAC address, IP address, current channel, sensitivity, DHCP client mode, CRC filter option, number of 802.15.4 packets received and dropped. At the bottom of the home page firmware version is located. This page provides Energy Detection measurement for the all 31 channels during 2s period. Results are shown in graph separated for each frequency band. This mode allows to transmit single tone signal (CW – Continuous Wave) or random signals (PRBS – Pseudo Random Binary Sequence). It is useful for RF related measurements (TX power, harmonics) and other test purposes such as generating RF noise on the particular channel. Continuous Transmission Mode starts by click on the LAUNCH button. Fc stands for the channel center frequency. Note that in CW mode it is not possible to transmit a RF signal directly on the channel center frequency. PRBS: 0xAAAA… – Repeated hexadecimal value A (1010 binary). PRBS: 0×0000… – Repeated hexadecimal value 0 (0000 binary). PRBS: 0xFFFF… – Repeated hexadecimal value F (1111 binary). Channels 0 – 3 (780 Band): Modulation O-QPSK_250. Channel 0 (868 Band): Modulations BPSK_20 and modulation O-QPSK_100. Channels 1 – 10 (915 Band): Modulations BPSK_40 and O-QPSK_250. Channels 11 – 26 (2400 Band): Modulation O-QPSK_250. This mode is dedicated for packet transmitting. Several parameters such as payload, number of repetitions or delay among packets might be set. 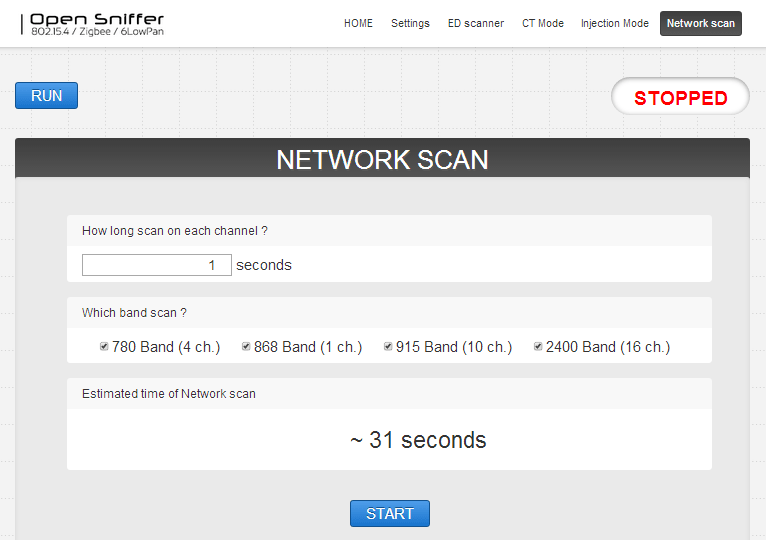 Network scan search for frames among specified channels and bands. If 802.15.4 network is found network PANID is displayed otherwise “unknown” network or no frame is shown.